Have you ever wondered about the people who developed ways to keep us healthy, such as the use of antiseptic? Explore the lives of some of most amazing doctors and gain a unique insight into the lives they led and the challenges they faced. We have all relied on doctors and nurses at various points during our lives. However, the great stories behind so many important and influential achievements remain unknown. 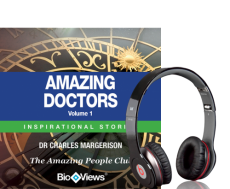 This short audio collection explores the life stories of Elizabeth Garrett, Joseph Lister and Christiaan Barnard and reveals how they each developed their remarkable skills and methods to help patients all over the world. In different ways, they paved the way for modern medicine and saved countless lives by advancing the boundaries of treatment.